Hand Painted Lacquer Boxes from Russian Master Artists. These works of art claim no magical powers - yet, all who come near willingly fall under their spell. Drawn by the mirror like sheen, the subtile luminosity, the precise craftsmanship of their construction, and the brilliance and depth of their color palette - lovers of beauty are soon enchanted by the intricate images and elegant charm of the Russian lacquered miniature. This unique and important 20th century art form carries on all the finest traditions of old Russian artistic culture, and evolution of the icon painting of pre-revolutionary eras, these exquisite hand painted boxes, plates, and jewelry represent the accumulated artistry of generation upon generation. To study these beautifully embellished pieces in all their variety of shapes, sizes and themes is to explore the warmth and breath of the Russian soul. Subjects range from folklore and fairy tales to the everday events of simple village life. 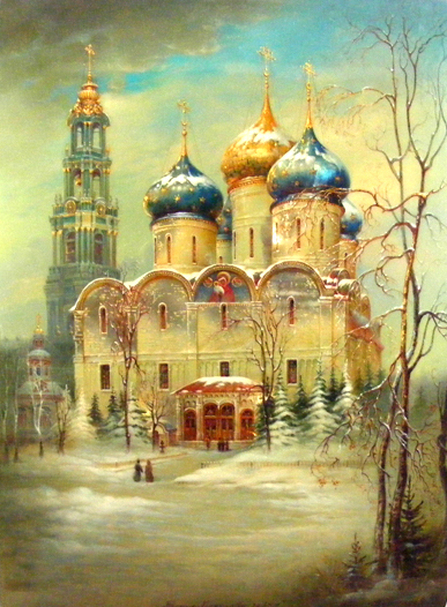 From the beauty of Russia's landscape and its destictive architecture to the rich history of its passionate people - all depicted in detail so fine that much is painted under intense magnification, using the slenderest of brushes. Once begun, a love affair with these small wonders can only grow - for the more closely we examine the skillfulness of their creations, the more deeply we must appreciate their place among the masterpieces of todays's artistic expressions. E.Kirkland Co.,aka Serendipity was established in 1971 and, from its inception, it had enjoyed the reputation for "Bringing the Best from Europe" to delight discriminating collectors whose taste favor the finer things in life. Russian Lacquer first captured the attention of the owner in 1973, when she acquired some boxes for her personal collection and pleasure. Serendipity enjoyed hosting the best of the Russian artists on many occasions after the Iron Curtain fell in 1991. Master Artists from Fedoskino, Palekh, Kholui, and Mstera had visited the gallery from 1992 until 1998. Serendipity was sold, but E. Kirkland Co., retained the Russian Lacquer Art. This is the first time this fine collection has been offered, please browse and enjoy!